Argentine scientists are studying the effects of global warming by strapping plastic tanks to the backs of cows to collect their gas. Researchers say the slow digestive system of cows makes them a producer of methane, a powerful greenhouse gas that gets far less attention than carbon dioxide as a potential cause of global warming. 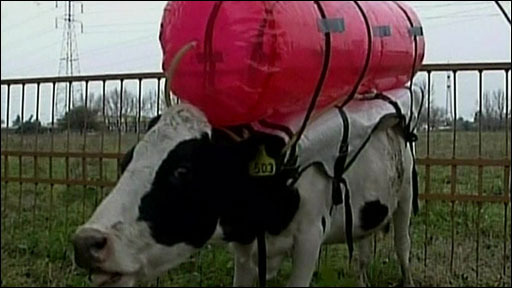 The plastic tank is fitted to the cow's back and connected through a tube to the animal's stomach.